The building industry can be characterized by a lack of true integration of building disciplines in the design phase. Traditional methods lead to redesign and optimization by iteration, whereas to meet the challenges of today’s requirements for the built environment, we need to go further and generate new concepts supporting improved knowledge-sharing. The typical design process involves a lot of communication, often via email, illustrated with screenshots, Excel overviews or PDF reports. By its nature, design review is an iterative collaboration process requiring constant involvement and input from different disciplinary experts and stakeholders. The challenge is to keep track of all this communication and to prevent things from being forgotten or lost because of unclear ownership. The architect can begin the design task on his or her own but can start directly to document challenges (issues) to be shared and solved by engineers. This helps to include engineering knowledge from early design phases, leading to a more efficient design process that eliminates unnecessary iterations. With most projects now done using BIM (building information modeling), it is essential that the documented issues are integrated in the BIM data, containing viewpoints with camera positions and references to the related objects. The power lies not only in the automated documentation and history tracking, but also in the alignment with the model itself. The way to do this is defined in BCF (Building Collaboration Format), a BuildingSMART open file format developed specifically for this purpose. A BIM issue-management system can only bring benefits if it is built on top of this data format and when it is integrated with the BIM tools used in a project (Figure 1). When facing tight deadlines and a high volume of modifications during the design and construction phase, the traditional coordination approaches—such as email, phone, and PDF reports—are not an effective methodology. Instead, using a collaborative cloud platform that works on the last and unique version of the project models as well as manages the information exchange by integrating BCF into BIM software is a much better way to run these projects. Figure 1. Issue management integrated with ARCHICAD. In any building design process, several different tools could be used by different specialists to create BIM data. This is a fact of life and cannot be forced differently because of the ever-changing composition of project teams. The model data is often collected and combined in special coordination software, often via open standards or in cloud solutions, from full-fledged project management systems to simple document sharing tools like Dropbox. But the missing link is very often the communication “about” the model data. BIM managers need solutions to bridge the (communication) gap between these BIM tools. And that is exactly where BCF comes in. It integrates the communication into the model data by means of viewpoints and IFC GUIDs (GUID stands for “Globally Unique Identifier” and you can find more information about it on the BuildingSmart website), allowing issues to be assigned to one team member to be resolved or handed over to other participants for approval. Comments can be added to the issues and all changes are logged for legal trail. But most importantly, each design discipline can continue to use its own preferred modeling and analyzing software. A collaboration platform for the exchange and coordination of issues can even be fundamental in the transition to real BIM with the sharing of project data. It is vital that the BIM data, supplied by different design disciplines, is correct and complete and also in compliance with legislative and regulatory requirements like structural, sustainability and energy consumption. Can a building be built as designed? Is there enough space for a wheelchair? Also, what are we going to do with the pipe that the mechanical engineering consultant has positioned exactly where the structural engineer wants to have a steel column in the model? In short, a large number of different aspects of models must be verified with an intelligent model checker: a tool to merge and analyze models to detect clashes or other “issues” that must be resolved before construction can start. Detecting issues or clashes with model checkers is one thing; making sure that they are resolved is something else entirely. Project leaders assume a smooth, trouble-free communication between all the members of a multidisciplinary design team. To illustrate how issue management can work, let's start with the example mentioned above, where the position of a pipe clashes with a steel column. The problem is found with clash-detection software. The BIM manager or team leader assigns the issue to the mechanical engineering consultant, who then receives a ticket within his/her own modeling software. With just one click, the consultant automatically zooms in on the problem spot, repositions the pipe away from the column, resolves the issue with a comment assigning it to the project leader, and submits the revised model. The project leader, who is responsible for validating the solution, clicks the issue link too. He/she can now view the revision in his/her BIM tool, verify that it works, and approve it. Problem overcome, issue solved (Figure 2). The project team members don't have to deal with numerous emails during the week but just have to take a look at their dashboard once a week. This reduces unnecessary clutter and streamlines the process for the team. Also, all the issues, comments and history are in one place, enabling a clear audit trail. Figure 2. Schematic lifecycle of an issue. Without this kind of integrated BIM issue-management, projects will continue to deal with issues on an ad hoc basis and will never reach a point where data has no defects anymore before construction starts. The design for an average office building can easily give rise to 1,000 to 3,000 issues, whereas 50,000 or more may be identified when designing more complex projects, as was the case with AECOM on the Kuwait International Airport Terminal 2, a 750,000 sqm project designed by Foster & Partners (Figure 3). The quality requirement for the project—it was setting a new environmental benchmark for a high level of comfort in airport buildings—obliged the team to track every single change, from the tender design to the final construction. Keeping the large number of issues in one stand-alone software was unmanageable. Switching to a cloud-based BIM issue-management platform has eased the communication between the teams and allowed the BIM managers to track every action taken. Figure 3. Kuwait International Airport Terminal 2 designed by Foster & Partners. With a well-prepared overview of the issues to be discussed, design review meetings can be greatly reduced in time. Instead of going through all models and issues, only the ones prepared for discussion are dealt with. If the issue-management software contains visual snapshots of the problems, participants can understand enough to agree on a “to-do” for the right team member in the meeting itself. There is no need to go into the model. But when needed, having the BCF data available can allow users to zoom to the right location in the live model in seconds as well. This can be in a dedicated viewer linked to the BCF based issue-management system, provided it can handle the model data quick and smooth, or (when well integrated) also one of the authoring or coordination tools used in the project like Navisworks or Solibri Model Checker. All action items discussed during design review meetings can be logged directly in the issue-management system, including deadline and person responsible. On the fly, a to-do list for all participants can be made available. The issue data should be accessible in all BIM tools used by the team members so they can start with resolutions right after the meeting. Another advantage of a centralized structured issue-management system is that responsibility for creating solutions is clearly defined or delegated, if needed. Also, the approval process for accepting resolutions can be set up to follow the team’s responsibility structure. Notifications can be sent to inform others about discussions or to ask their input. A centralized cloud based database storing all the communication about issues or requests for information can track all changes and comments, thus creating a non-detachable, legal trail as a single source of truth for individual accountability. Project leaders can set milestones, deadlines and responsible persons. When the system allows every team member to create issues and add comments, non-BIM specialists can join the process in addition to the project-owner or clients. 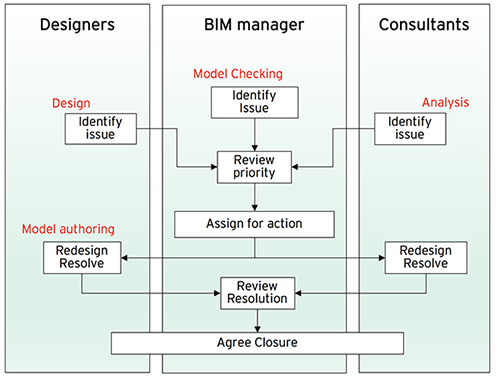 A BIM issue-management system with an integrated model viewer can optimize the design process by involving stakeholders who otherwise would not be able to access the data or the BIM model, such as quantity surveyors, managers and other staff. When they can access the BIM data to create issues, it gives them greater involvement and awareness of the design intent earlier in the process. Issues can be delegated within an organization or transferred from one organization to another. This supports lean project organizations with a transparency needed for better understanding and trust between all stakeholders. For the described workflows and examples to function team-wide and to deliver the promised benefits, it is essential that the chosen issue-management process is centralized, preferably cloud-based and integrated in the most commonly used BIM software like Revit, ARCHICAD, Navisworks, Tekla Structures, Solibri and more. The BCF format is becoming more and more accepted as the standard for communication about models, distinct from the model data itself but still associated with it. While BIM tools themselves or plug-ins can offer BCF support or direct connection to cloud based issue-tracking systems, a dedicated issue-management tool that can organize and help to resolve the large number of issues in AEC projects is essential to creating the high-quality BIM data for successfully executing these projects. 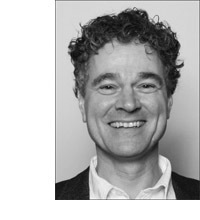 Erik Pijnenburg is founder and CEO of KUBUS, a BIM software and consultancy firm in the Netherlands. He is an experienced industry professional who has spent 25 years in developing and teaching design workflows with BIM. KUBUS has been a distributor for ARCHICAD in the Benelux since 1995, a gold partner of Solibri Inc. since 2010, and developer of the BIMcollab ecosystem for BIM issue-management. KUBUS has 50+ employees and serves over 4.000 users in the Benelux, while BIMcollab is used by close to 30.000 users all over the world.